The Mausoleum of Galla Placidia. The building on the left is the Santa Croce. 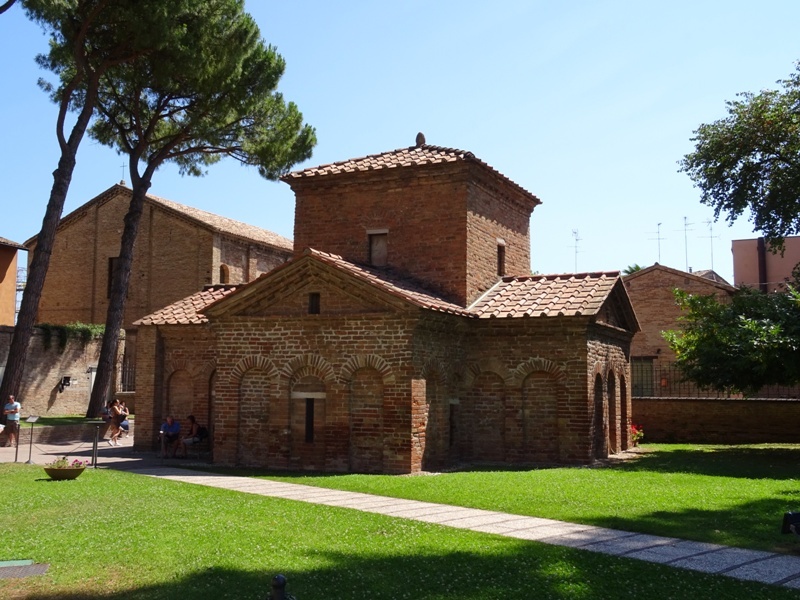 The so-called ‘Mausoleum of Galla Placidia’ used to be part of the Santa Croce church, a part of which can be seen on the left behind the mausoleum. The Santa Croce is now closed to the public. It was possibly built between 417 and 421, when Galla lived in Ravenna with her husband Constantius. If this is true, then the church is slightly older than the San Giovanni Evangelista. However, it is also quite possible that the church was built later, after 425, when Galla’s son, the boy Valentinianus III, became emperor of the Western Roman Empire. 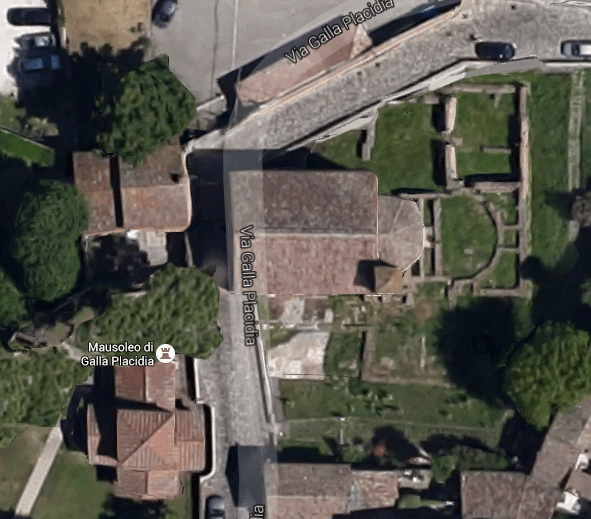 It is no longer possible to visit the Santa Croce, but the church can be seen from above on Google Earth, and then it immediately becomes clear that the original building used to be much larger. Much of the eastern end of the church is in ruins. The western part of the Santa Croce, where the original entrance would have been, is entirely gone. What is left of the church has perhaps half the length of the original building. However, the cruciform shape of the fifth century church is still quite visible and one can also imagine how the mausoleum was attached to the narthex of the church. Mausoleum and Santa Croce seen from above (© Google). Before I discuss the beautiful mosaics inside the mausoleum, let us explore the relationship between the Santa Croce church and the mausoleum a bit further. In her excellent book Ravenna in Late Antiquity, Deborah Mauskopf Deliyannis has argued that the Santa Croce in Ravenna, dedicated to the Holy Cross by a devoutly Christian Roman empress – Galla Placidia -, was meant as a reminder of another devoutly Christian Roman empress: Helena, mother of Constantine the Great. Helena was credited with finding the True Cross in the Holy Land during her visit to Jerusalem in 326/327. 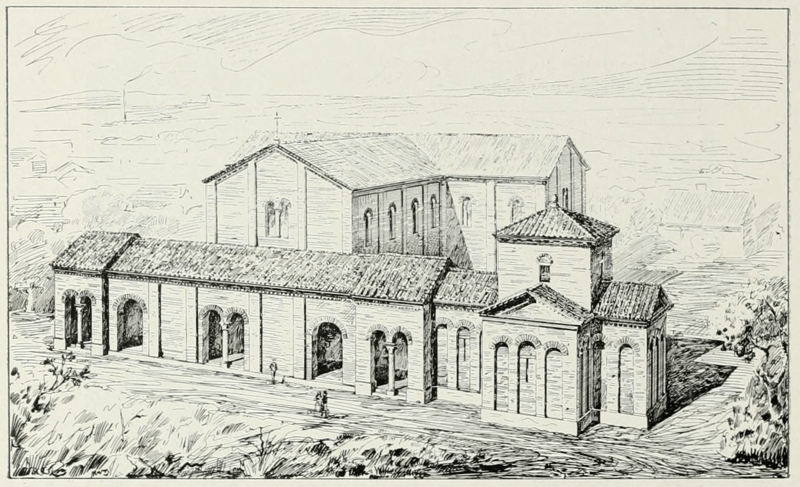 A palace church in Rome had been dedicated to the Cross and this private chapel became a public basilica at a certain time after Helena’s death between 327 and 330. I am of course referring to the Santa Croce in Gerusalemme. 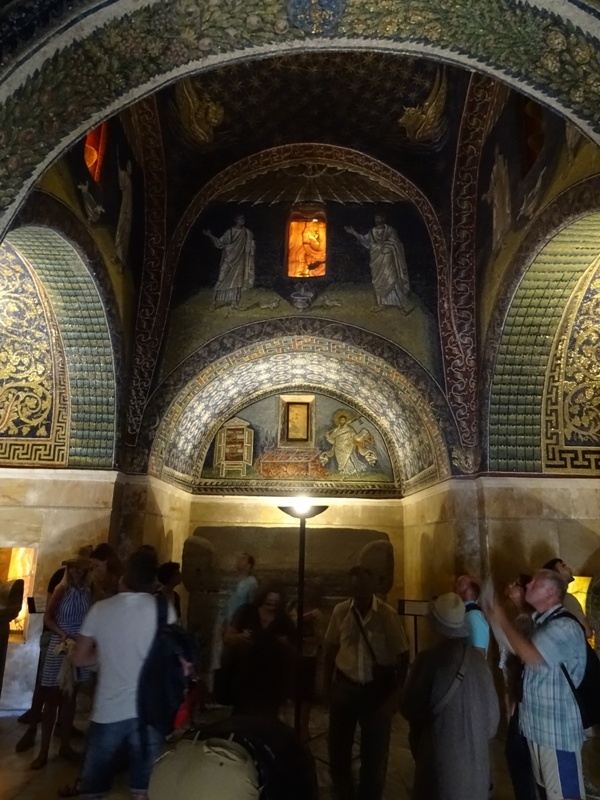 According to Mauskopf, Galla Placidia and her children sponsored a mosaic (now long gone) in that church in Rome. The Santa Croce used to have a narthex, to which the northern arm of the mausoleum was connected. Italian archaeologist and historian Corrado Ricci (1858-1934) has attempted to reconstruct the original building. Since a picture says more than a thousand words, I will simply refer to the image on the right. It is sometimes assumed that another chapel or mausoleum was attached to the other side of the narthex. This sounds plausible enough in theory, as it would have given the church a perfectly symmetrical layout. However, there is (as yet) no archaeological evidence to back this theory up. At the moment, the idea of a “northern chapel” is purely based on speculation. Was the mausoleum really intended as a final resting place for a member of the imperial family, for Galla Placidia or for someone else? Or was it a memorial chapel for a saint? Mauskopf Deliyannis convincingly argues that these two options are not mutually exclusive: the mausoleum might have been intended as a multi-purpose building. There may have been an altar in the eastern arm of the building and the three sarcophagi inside can be dated to the mid-fifth century, although we do not know when exactly they were placed here. So the conclusion that the Mausoleum of Galla Placidia was both a chapel in the Santa Croce church AND a mausoleum is quite feasible. We can, in any case, be fairly certain that Galla Placidia was never buried here. After an eventful life, the empress died in 450 in Rome and was no doubt interred there. The legend that she was buried in the small, cruciform building now named after her seems to date from the thirteenth century. The mausoleum, constructed mostly of reused Roman bricks, has the shape of a Greek cross – unlike the Santa Croce, which was originally built on the plan of a Latin cross. The entrance to the mausoleum is in the north arm of the building, where the mausoleum used to be attached to the narthex of the church. The mausoleum is by no means a large building. The north-south branch is little under twelve metres deep and the east-west branch just over ten metres. When large hordes of tourists arrive – which I believe is seldom the case – only a handful of visitors are allowed inside at the same time, and the time one can spend inside is limited as well. Fortunately, it was fairly quiet when I visited the mausoleum in June 2016. I had plenty of time to admire the beautiful mosaics and to take as many pictures as I wanted. Whether the claim about Cole Porter is correct or not, is up for debate (he did visit Ravenna in the 1920s), but the atmosphere inside is certainly magical. Mauskopf Deliyannis uses the term ‘jewel box’. The first thing the visitor sees upon entering is a lunette with an alabaster window on the south wall. The lunette contains a mosaic with a book cabinet on the left, a gridiron and flames in the middle and a man dressed as a deacon on the right. Although other explanations and interpretations have been given, the man is usually identified as Saint Lawrence (San Lorenzo in Italian). The cult of Saint Lawrence was certainly popular in the fifth century and we have already seen that the Western emperor Honorius built a basilica dedicated to Saint Lawrence in Ravenna after moving the imperial court to that city in 402. According to church tradition, Lawrence was a deacon in Rome and martyred during the emperor Valerianus’ persecutions in 258. A legend dictates that he was tied to a gridiron and subsequently roasted alive above the flames (the same legend claims he asked to be turned over after a while, as he was ‘well-done’ on one side). Lunette in the south arm. Lawrence is holding a book in his left hand, but there is no actual text on the pages, just illegible scribbling. He has a large processional cross draped over his right shoulder and appears to be moving (some would say running) towards the fire. If the mausoleum was indeed used as a chapel, it seems logical to assume it was dedicated to him. The book cabinet – armarium in Latin – on the left contains the four Gospels, clearly marked MARCVS, LVCAS, MATTEVS and IOANNES. 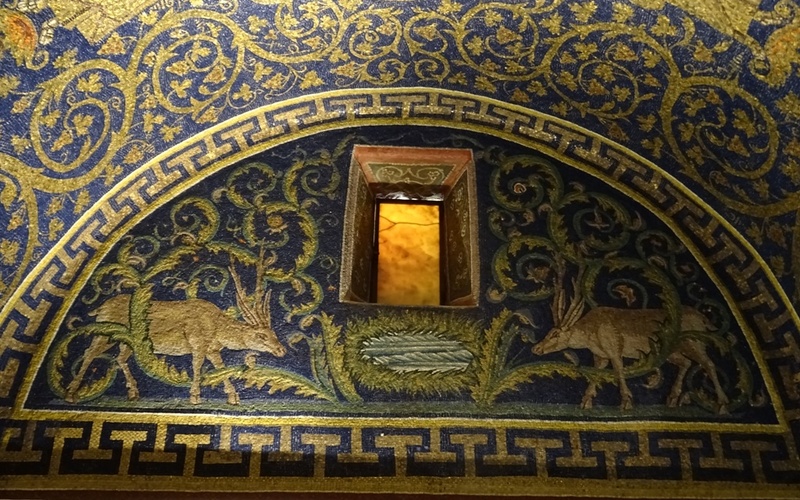 The lunettes in the west and east arm of the mausoleum have mosaics of acanthus scrolls and two deer moving towards a pool. They are an obvious reference to Psalm 41(42), “quemadmodum desiderat cervus ad fontes aquarum ita desiderat anima mea ad te Deus”, which translates as “As the hart panteth after the water brooks, so panteth my soul after thee, O God” (King James Version). The barrel vaults above the two lunettes have acanthus plants, gold grapevines, men identified as either evangelists, apostles or prophets and the chi-rho symbol with the alpha and the omega, a reference to the Book of Revelation. Two more elements of the mausoleum need to be discussed here: the lunette above the entrance and the dome. The lunette contains a beautiful mosaic of Christ as the Good Shepherd. The haloed Christ is holding a large processional cross (instead of a shepherd’s staff) in his left hand while feeding one of his six sheep with his right. Christ is not dressed as a simple shepherd. He is wearing an expensive looking golden tunic with purple stripes. He is also beardless, with long hair flowing over his shoulders. Christ as the Good Shepherd. While Christ calls himself The Good Shepherd in the Gospel according to John – “I am the good shepherd: the good shepherd giveth his life for the sheep” – images of sheep and shepherds were already widely used in pre-Christian classical art and subsequently copied by early Christians. The shepherd, sometimes carrying a sheep on his shoulders, was actually a common theme in classical art, often used in scenes celebrating the peaceful and serene country life, with the shepherd taking good care of his flock. Sculptures of shepherds were also used as votive offerings and even as classical ‘garden gnomes’ in Roman gardens. 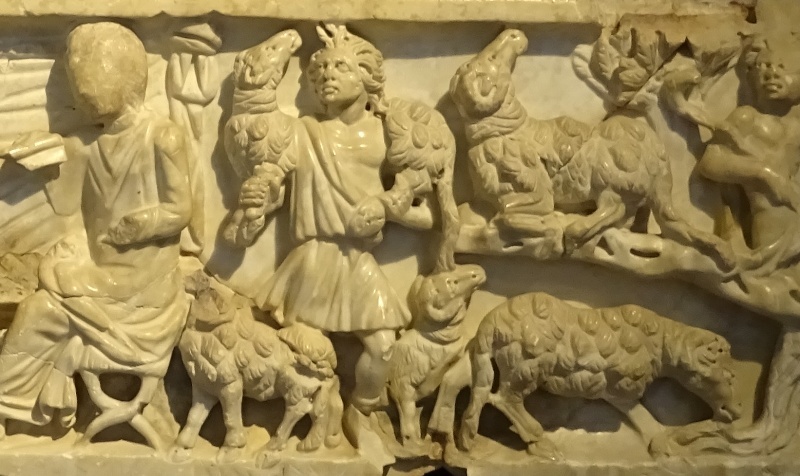 Shepherds and flocks of sheep can also often be found as part of bucolic scenes on pre-Christian sarcophagi. An example is the ‘pagan’ sarcophagus of a child which is now in the Museo Nazionale di Ravenna (see the image on the right). The Christ in the mosaic in the Mausoleum of Galla Placidia may also have been based on images of the musician Orpheus from Greek mythology, who is often depicted as playing his lyre among the animals, including sheep. Finally, the dome of the mausoleum. There are apparently 567 stars on the ceiling (I have not counted them myself; I rely on Mauskopf Deliyannis instead), which at its highest point is 10.7 metres above the floor. 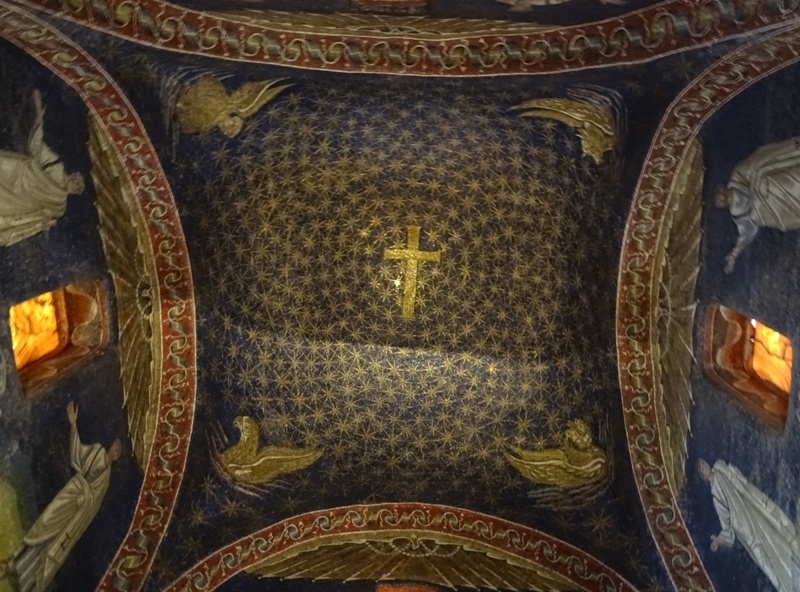 In the centre is a golden Latin cross and in the four corners we see four winged figures associated with the Book of Revelation and – since the early third century – the four Evangelists: a Man for Matthew, an Ox for Luke, an Eagle for John and a Lion for Mark. Since I do not feel qualified enough and dislike semi-educated guesswork, I will leave the discussion of the overall meaning of the imagery found inside the mausoleum, on the walls, in the lunettes and on the dome, to experts. A good summary of the literature can be found in Mauskopf Deliyannis’ superb book about Ravenna in Late Antiquity. Saint Lawrence is also depicted in the apse mosaic of the Santa Maria in Trastevere in Rome. For interesting churches dedicated to this saint, see for instance the San Lorenzo in Lucina and San Lorenzo fuori le Mura in Rome, or the San Lorenzo Maggiore in Milan. And it’s true some hobbies are like that.